I made the mistake of buying the Giovanni DVD w. Keenlyside. His singing, plus the other cast, was excellent but the production was unwatchable -- avante garde to the max, with goofy and unintelligible staging. Worst of all, the Stone Guest (always a fun event) was instead some hand-carried African-influenced carving about 15 inches high. 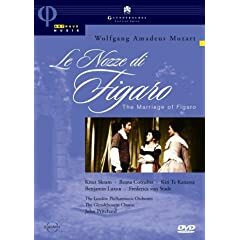 The other parts of the production were so awful that I actually fastforwarded thru it, something one never should do with Mozart. Can someone recommend a good full length Giovanni DVD? It doesn't have to be a totally traditional staging, but it would at least be somewhat faithful to the original. And of course, good cast and good music. Maybe Joseph Losey's movie with Ruggero Raimondi, Kiri Te Kanawa, Teresa Berganza and Jose van Dam will be to your liking. Traditional setting and musically it's fine. But keep in mind that it's not a live performance but a movie. Okay, it may be a movie and not a stage performance, but is it full length like onstage or is it cut? Yes - it is full length. If you want a stage performance the Franco Zeffirelli production at the Met with Bryn Terfel and Renée Fleming is great. I'm sure you'd enjoy either one of these dvd's more than the one you have. Last edited by jhar26; Dec-26-2010 at 18:41. Thanks for the suggestions. I will check out both DVDs and see what happens. I can handle a bit of "eurotrash" and I surely don't like the old style "park and bark" style, but the Giovanni I bought is hideous. Last edited by jhar26; Dec-26-2010 at 18:44. Thank you soooo much for the samples! The bad lipsync in the movie would probably drive me nuts. I'll definitely get the other DVD. I'm a big fan of Bryn Terfel anyway. There's no bad lipsync on my copy of the DVD as there is in these clips, and picture quality is a lot better too. The Terfel/Fleming DVD is definitely a good buy though. Just received and watched the Giovanni DVD you recommended -- Bryn Terfel, Renee Fleming, Met Opera production. This is exactly what I was looking for -- terrific singing, traditional staging, and I really like Levine's conducting -- brisk yet lush. It's not Mozart's most "serious" opera, but very entertaining with outstanding music. Dorothea Roschmann is wonderful as Pamina, but one performance that stuck out for me was Simon Keenlyside as the bird catcher Papageno. Could anybody point out some other good productions he has been in? I think he's amazing. In a word - superb. It shows its age in terms of production values (compared with the Glyndebourne Cosi), but what fabulous performances. Cotrubas is a terrific Susannah - I found myself drawn to her enormously, full of vitality, and singing apparently as naturally as a bird. And the excellence multiplies. When Von Stade sings, it seems as if the world should stop and listen. And Kiri is completely in her element. So there's brilliant singing; generally good acting, which is sometimes excellent; attractive, traditional sets, if not particularly remarkable. It all adds up to a package not to be missed. From a purely personal point of view, I'd say that if I had to choose between this and Cosi, I'd choose Cosi - partly because I prefer the opera itself, and partly because I do think the whole presentation is more beautiful, and the acting more fluid. But I hardly think one is really 'better' than the other. Both are necessary Mozart DVDs. Last edited by jhar26; Dec-25-2010 at 15:51. Thanks again for pointing me towards it, Gaston. I don't want to brag, but I told you so, Alan! Seriously though, I'm happy you like it. It's an overall great performance, but I agree that those three gals really stand out here. Last edited by jhar26; Dec-25-2010 at 15:55. I don't want to brag, but I told you so, Alan! I never doubted you on this! What I want now is a DVD recommendation for Don Giovanni, please! What I want now is a DVD recommendation for Don Giovanni, please! ...even though Terfel doesn't really look the part. Vocally he's excellent though. There's also the Joseph Losey movie which is quite good (VERY good according to some), but for me there's too much walking through corridors, through the countryside from one location to the next - in short, too many scenes that try to prove that this is a movie and not a stage production. Still a good effort and definitely worth seeing, but a bit overrated in my opinion. The statue scene is rather poor, but Raimondi is a great Giovanni and he looks the part. Still, the Levine/Terfel/Fleming set is the best of this lot in for me. I would rank it just a little bit below the Cosi and Figaro you have, but it's nevertheless very good. Last edited by jhar26; Dec-25-2010 at 15:59. I would rank it just a little bit below the Cosi and Figaro you have, but it's nevertheless very good. Sounds like the best one for me to try - I think I'd probably shy away from Don Giovanni - The Movie. Thanks Gaston. Why no Mozart no. 37? All times are GMT +1. The current date and time is Apr-24-2019 23:35.